Rod Dixon told tales of travail and triumph to set the stage for this summer of running. Dixon, an Olympic medalist at 1,500 meters in 1972 and winner of the New York City Marathon 11 years later, was the featured guest at a recent social hosted by the Santa Barbara Athletic Association (SBAA). The SBAA has been promoting fitness and competition through running since the mid 20th century—well before the sport became a fashionable recreation. It is the longtime sponsor of the Semana Nautica 15K, a 9.3-mile road race that has been run every July 4 since 1955. In its earlier days, the race was a showcase for the elite of Southern California distance runners, including Olympian Ron Larrieu and six-time winner Gary Tuttle. Sergey Sushchikh (left) finished behind Forest Braden in the Semana Nautica 15K Run on July 4. Forest Braden and Sergey Sushchikh put on a show Monday in the 57th running of the 15K. Braden, 28, is the distance running coach at UCLA. Sushchikh, 18, is a Dos Pueblos High graduate who will be competing for the Bruins. The youngster bolted into an early lead on the residential streets and bike paths that link Santa Barbara and Goleta. In the last miles, Braden’s strength and maturity took over. He hit the finish line at San Marcos High School 47 seconds ahead of his understudy. The winner’s time, 48:33 (a pace of 5:13 per mile), was the fastest since 2005. Braden predicted a bright future for Sushchikh. “I like his guts,” said the coach, a former All-American at Boise State. The 15K had 286 finishers. Twenty of them broke the hour barrier, including women’s winner Mandy Grantz (55:37), a precocious 25-year-old Caltech grad student in chemical engineering who finished 10th overall. Dixon achieved the pinnacle of his running career on the streets of New York. Before then, the New Zealander was known for his tantalizingly close finishes on the track. He was favored in the 5,000 meters at the 1976 Montreal Olympics but came up fourth in a blanket finish. “I was devastated,” he said. In 1983, Dixon put his focus on the marathon. He went to New York with what he called “the four sides of athletes—emotional, physical, mental, and spiritual”—all in alignment. He gave the details of an extraordinary interval workout: a two-mile in 8:40, a mile in 4:03, an 800 in 1:51 and a 400 in 52.3. His final tune-up was a practice mile in 3:58.3. At 60, the Kiwi champion still appears in racing trim. 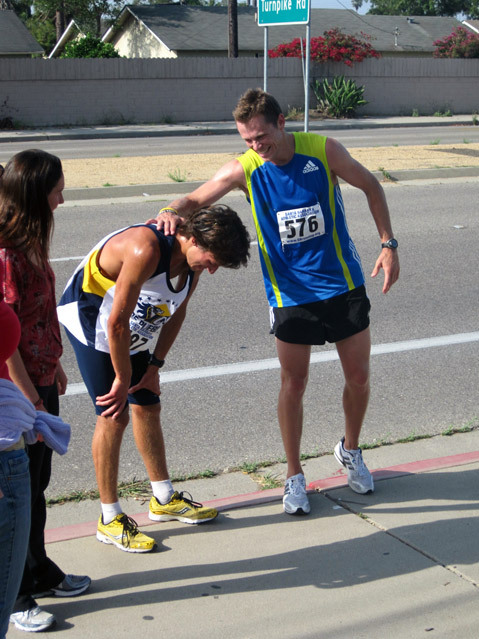 He has made a home in Southern California, from where he promotes a children’s running program in various cities. He also is director of training and coaching for the L.A. Marathon. Dixon expressed concern about that race, which is a property of Frank McCourt, the bankrupt owner of the Dodgers. But that’s another story. Runners—and the hybrids who do the triathlon—find their sports thriving in Santa Barbara. There are two weekly running and swimming events on the waterfront throughout the summer: The Reef & Run Summer Series at East Beach on Tuesday evenings, and the Nite Moves Summer Sunset Series at Leadbetter Beach on Wednesdays. Many athletes are training for a triple crown of triathlons in the area: the new Goleta Beach Triathlon (July 31), the Santa Barbara Triathlon (Aug. 27-28), and the Carpinteria Triathlon (Sept. 25). The year’s most challenging runs are the Pier to Peak Half Marathon (Sept. 4) from Stearns Wharf to La Cumbre Peak; and the Santa Barbara International Marathon and Half Marathon (Nov. 12). Hardy bike riders will be plying the Alpha Resource Center’s Climb the Canyons Cycling Classic starting at Girsh Park this Saturday (July 9). The 70-mile course includes 11 categorized climbs in the foothills. Baseball is also thriving here. Unlike the Dodgers, the Santa Barbara Foresters are not saddled with ill-gotten debts. Their roster of collegiate standouts plays an energetic brand of ball. The Foresters entered the week with a 19-7 record, and they will be hosting the Rawlings California Cup at UCSB this weekend. They will play games at 4 p.m. on Thursday, Friday, and Saturday (July 7-9), hoping to reach the championship at 1 p.m. Sunday.